New England Golf and Tennis Camp offers a variety of tennis programs for campers of all levels. Our on-campus tennis training facility is the perfect setting for kids that are passionate about improving their tennis game. Our world class tennis staff is comprised of USTA & USPTA certified professionals, college coaches and college level tennis players. Why Choose New England Golf and Tennis Camp? 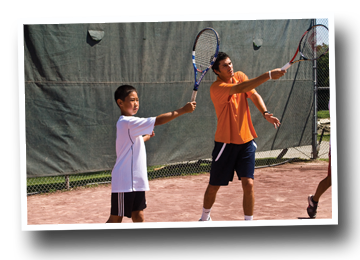 Get top professional level Tennis instruction in a traditional camp setting. That’s what makes us unique! Tennis: Rain or Shine! We have indoor courts nearby. In the Unique Competitive Program campers play 1-2 matches per day. Tennis groups change daily based on ladder play which ensures proper grouping. Our campers can wake-board, water-ski and tube on a daily basis. All of our staff are resident. Tuition covers all programming including private lessons and optional activities, weekly all camp trip, all meals, snacks, 24/7 supervision, weekly laundry service and more.